I did my philosophy MA dissertation on abstract art and expression and synaesthesia. When you strip it down, it's fascinating that inanimate canvas, paint, abstract shapes and colours can move us profoundly and ineffably and I wanted to tell a philosophical story about that which also incorporated art history and psychology. I'm still fascinated by these ideas. Orphism (1910-1913) was a brief but important art movement to consider in this context. It marked an early manifestation of abstraction and drew upon a connection to music, because music evoked emotion without necessarily telling a representational or coded story. 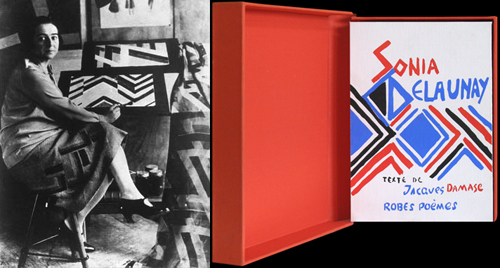 Robert and Sonia Delaunay pioneered the movement. Sonia's work extended beyond painting to textile and stage set design. She was the first living female artist to have a retrospective exhibition at the Louvre in 1964, and in 1975 was named an officer of the French Legion of Honor. It's extraordinary to think of Sonia holding her own in the company of her husband, Picasso, Braque, and Vlaminck et al., rather than simply filling the more predictable role of muse and model. One hundred years later, it's easy to underestimate those bold early steps in abstraction. Of course the Orphists didn't take the first steps (Impressionism, Fauvism and Cubism preceded them). But they arguably came closer to letting go of the representational object than those movements that preceded them and, in that way, paved the way for abstract expressionism and all that followed.